Bhanu Saptami is celebrated on the Saptami day (seventh day of the waxing lunar month) that falls on a Sunday. This day is also called as Surya Saptami or Vyavasvathma Saptami, Bhanu being one of the several names of sun god. The greatest importance of this day is the worship of sun god praying for good health, longevity and wealth. It is believed that those who observe this vrat shall never succumb to deadly sicknesses all through their lives. Bhanu Saptami marks the day when Lord Surya or sun god ascended his chariot. A beautiful anecdote in the Chhandogya Upanishad describes the process of creation when the cosmic egg split into two halves, one gold and the other silver. The silver part became the earth and the golden one became the sky. While the outer cover became the mountains and the inner cover the snow and clouds, the inside veins started flowing as the rivers with the core liquid turning as the ocean. The arrival of sun god roused the earth into life and there was a big cry of bursting forth into life from millions of beings. Since those times, myriad joyful cries are heard both during sunrise and sunset. The sun god is seated on a lotus set in a golden chariot. The chariot is drawn by seven horses signifying seven rays. The charioteer of sun god is Aruna, the red one who stands in front of the chariot and shields the worlds from being scorched by the heat of the sun. Sun is the giver of life for all beings and the god of health and vitality. Worshipping sun god on a daily basis can help people enjoy powerful eyesight and a disease free life. Fasting and worshipping sun god on Bhanu Saptami day is highly efficacious. Wake up early in the morning on the day of Bhanu Saptami. Take a holy dip in the Ganges or a holy river in your vicinity. If this is not possible, chant the mantras of Ma Ganga and invoke her in the waters in which you take bath. During bath, place a few leaves of Akka (Ixora Calotropis) and turmeric rice on the head and later wash them off while pouring water on the head. After the bath, the devotees place the Surya Yantra at an altar and perform a holy bath after sunrise and also offer water, flowers and Prasad to sun god. The fasting commences in the morning of Bhanu Saptami and extends the whole day long. In the evening the fasting is concluded after sunset. The devotees do not eat anything or drink anything on the day. A milder form of fasting allows partaking water, fruits and milk. Those who take bath in the holy Ganges on the day of Bhanu Saptami shall never remain ppor in their lives. 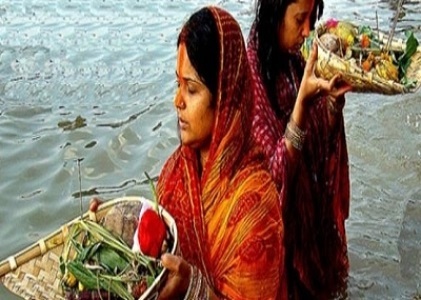 Women who do puja on this day will never become widows in their next lives. This vrat can help stay healthy and happy life long with never ending vitality throughout the life. Deadly diseases are cured with the blessings of sun god and the devotees attain good knowledge and great fortune.